I have obtained a new statement from HTC on the IPCom injunction in Germany. While it contains a claim I didn't find plausible in HTC's immediate reaction, one that misrepresents the scope of the injunction and another one that misrepresents the legal dynamics of how the injunction re-enters into force, its final sentence claims that HTC has worked around the asserted patent, which would make a fundamental difference in HTC's favor if true. But for the time being I'm also somewhat skeptical of that claim, given that the Mannheim court stated in another ruling that the related feature is a mandatory part of the 3G/UMTS standard. "On November 25, 2011, HTC withdrew its appeal in the IPCom EP1186189 case, finding that the appeal had become redundant since the German Federal Patent Court had previously held the relevant claim of the patent to be invalid." As I explained in my previous posts, the Federal Patent Court (BPatG) ruling they refer to was handed on December 1, 2010. It hasn't taken effect since (due to appeals by both sides), and it won't for approximately another two years (the estimated remaining duration of the appellate proceedings). That's why "redundant" doesn't make sense. If HTC had considered the appeal against the infringement ruling a waste of time and money, it would have withdrawn its appeal shortly after the BPatG ruling, i.e., almost exactly a year ago. A withdrawal so shortly before the hearing means to me that HTC was afraid of its expected outcome. "IPCom's original injunction covered only one HTC handset, which is now obsolete and is no longer sold in Germany." This is downright unbelievable. It contradicts not only the court ruling but also HTC's own interpretation of that ruling in a filing with the Taiwan Stock Exchange back in March 2009, issued right after the injunction was formally served on HTC. In that filing, HTC said that "[t]he court ruled that HTC products are infringing on the specified patent" and "[o]nce effective, the injunction will prevent HTC from selling or importing its mobile devices into Germany". I previously published the injunction as well as an English translation provided to me. The injunction is absolutely positively NOT related to any particular product. Instead, it relates to all HTC phones implementing the 3G/UMTS standard. 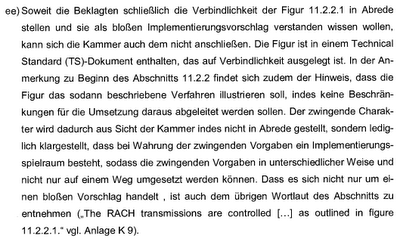 You can verify this if you look at the "reasoning" ("Entscheidungsgründe") part of the ruling. It explicitly refers to mobile phones (plural), makes it clear that IPCom argued based on the UMTS standard, and the ruling refers, on multiple occasions, to what the standard requires. A particular HTC product, the "T-Mobile MDA Touch Plus", is referred to as the "attacked embodiment", but only as an example shown to the court, as opposed to a strict limitation of the scope of the litigation. Under German law, it's key to show an actual or impending infringement in order to enable the court to take action for the purpose of eliminating the risk of repeated infringement. Besides the language of the ruling it's also important to take into account the amount of the bond. HTC was required to post a 7.5 million euro bond in exchange for a suspension of the enforcement pending the appellate proceeding. That amount corresponded to approximately 3.5% of HTC's revenues for an 18-month period (the standard duration of an appeal) based on HTC's German 2009 revenues of 180 million euros (in 2011, HTC's German business is more likely to amount to somewhere between 250 and 300 million euros, if not more, but the bond was determined based on 2009 revenues). "Furthermore, HTC has modified its implementation of the UMTS standards, so even in the unlikely case that the Mannheim court reinstates an injunction, it will have no impact on HTC's sales in Germany." This is the workaround argument I mentioned at the outset. HTC can try to tell the court that its current products don't infringe anymore. If the court believes that argument is reasonably likely to be meritorious, then this could result in substantial delays, but if the court doesn't buy this, then it won't help much. Given that the same judge had based his ruling largely on the specifications of the 3G/UMTS standard, HTC will have to come up with very convincing non-infringement arguments. 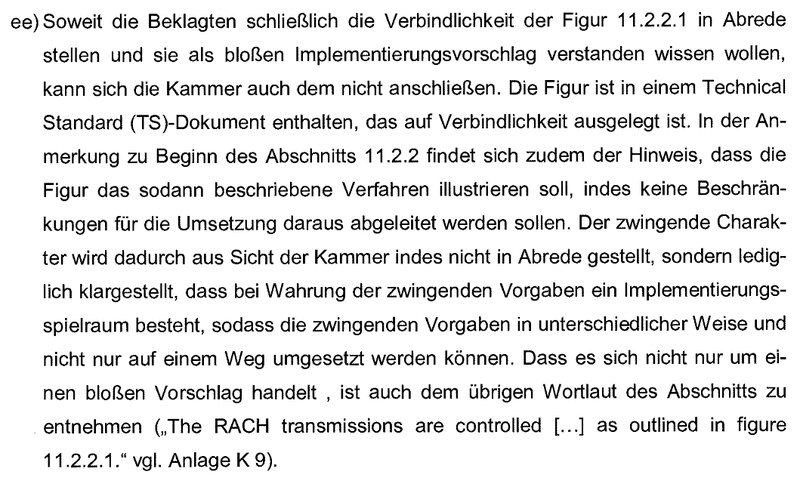 A quick summary: the first sentence says that the court disagrees with the defendants' denial of the mandatoriness ("Verbindlichkeit"), and characterization as a "mere implementation proposal", of a drawing in the UMTS specifications that describes the relevant technology. You may also take note of the expression "[d]er zwingende Charakter", which means "the compulsory nature". What furthermore calls into question the viability of a workaround is the fact that HTC already announced in its aforementioned March 2009 statement that it was "working with its chipset supplier to identify an alternative solution". HTC would have had every opportunity to present a workaround to the Karlsruhe Higher Regional Court during the appellate proceeding. It could have shown one today at the hearing, which was canceled only because HTC surrendered. IPCom's CEO told German news agency dpa that HTC is making a "massive attempt to mislead the general public"
Today IPCom announced that it has sent a formal notice to HTC demanding an immediate halt to the sale of all of its 3G-compatible smartphones (in other words, all of its smartphones) in the German market. Should HTC fail to comply, IPCom will ask the Mannheim Regional Court on December 5 to impose sanctions. In its report on the latest escalation of this dispute, German news agency dpa (Deutsche Presse-Agentur) quoted Bernhard Frohwitter, IPCom's CEO, as saying that IPCom considers HTC's statement quoted above "a massive attempt to mislead the general public". He stressed that the patent is valid as granted (the nullity proceeding hasn't been concluded yet) and that the ruling is "absolutely unambiguously comprehensive in scope" as opposed to limited to one particular patent as HTC claimed. In light of the court-established essentiality of the relevant invention to the UMTS standard, IPCom believes it is "very, very hard" to work around.